Kitchen and Residential Design: No really, what's a living finish? OK, so yesterday I ran through three basic, reactive metals that come into play when it comes to faucets: copper, bronze and brass. When it's the actual metal we're talking about, manufacturers use terms like "living finish" and "organic finish" to indicate that their fixtures will continue to age and change with time. I'll get into nickel, chrome and stainless (the non-reactives) later, for now I want to stick with copper, brass and bronze. Now, these living finishes are pretty much the exclusive province of the higher end of the market. For a lot of people, the changeable nature of brass, copper and bronze is a selling point. And that changeable nature comes at a premium. Here's a $1500 kitchen faucet from Herbeau. It has a living finish of weathered copper and weathered brass. And here's a $1900 tub faucet in weathered brass, also from Herbeau. These fixtures are truly made from brass and copper and then they have a patina applied to them in the factory. These patinas are pigments and chemicals that react with the base metal to speed up the aging process. These patinas allow the base metals to look like they're already aged upon arrival. On a living finish, the metal is left unsealed. That is, without a clear top coat to prevent corrosion. 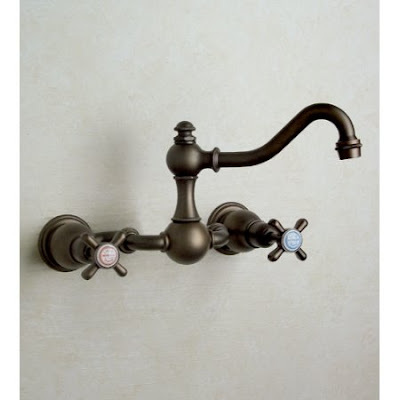 Without that clear topcoat, these faucets will also continue to age and their colors will continue to evolve as the base metal reacts with the environment. No two of these faucets will age at the same rate or go through the same color phases. Their continued evolution is completely dependant on the environment where they're placed. Hence the term living finish. It's important to remember that the world of plumbing fixtures doesn't use the conventions of science to categorize these finishes. Fixture manufacturers across the market use these metallurgical terms to describe a fixture's appearance, and not necessarily its composition. However, when there's a desirable base metal involved, that fact is made amply clear. Here's a deck-mounted faucet from Rocky Mountain Hardware. It's made from bronze and has had a rust patina applied to it. Rust is iron oxide, a common reddish pigment. 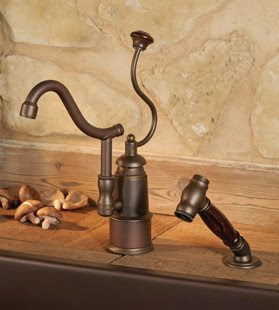 So this faucet is made from bronze with a reddish brown patina applied to it. With time it will continue to to turn more brown. It also has a suggested retail price of $1900. 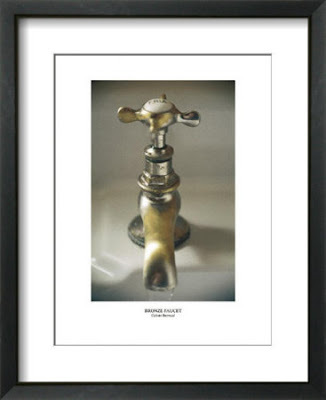 Here's a wall-mounted faucet, also from Rocky Mountain Hardware. 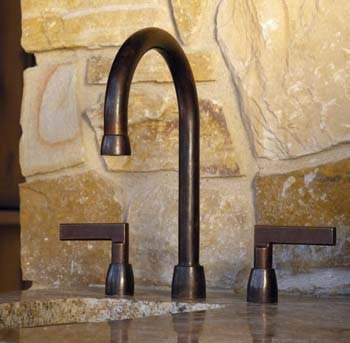 This faucet has been cast in bronze and has a medium patina applied to it. It carries a suggested retail price of $1600 and it's mind bendingly beautiful. Bronze has a warmth to it that no other metal comes near. Bronze has been a desirable metal for thousands of years for a very good reason --it's beautiful, strong and lasts forever. This medium finish also looks suspiciously like something that started showing up in the consumer market around ten years ago, oil-rubbed bronze. Now oil-rubbed bronze is where my conversation with the Kohler finish developer comes in. Since these living finishes and desirable base metals are the province of the high end of the market, how does this stuff trickle down to the consumer end? Well, come back tomorrow when I tackle the inter-market grudge match between true bronze and the oil-rubbed bronze gang. These faucets should be beautiful, especially the Rocky Mountain one. The price tags are quite high. For those of us with budgets, persevering during hard times, is there a consumer and budget friendly alternative? I will wait on your next installments. Thanks for doing the research and reporting back. Rocky Mountain does make some real beauties and their stuff, all of it, has a meatiness to it that no one else matches. Cast bronze is definitely in a class by itself. Unfortunately, it's always a premium. The knock offs have a come a long way though, but from everything I've read there don't seem to be any budget-friendly bronze fixtures out there. It's akin to looking for a budget-friendly built in refrigerator. Budget friendly and budget-minded seem to be conflicting terms. Though if I'm wrong please correct me. I'll go through some non-rarefied alternatives tomorrow. Thanks for following along.